If you’ve been following the postings on this site regularly, you’ve probably noticed how many different points of view there are about the virtues (or lack thereof) of various types of mystery. In fact, you might well wonder how EQMM has managed, for more than seven decades, to hold together a readership composed of so many seemingly incompatible types of fans. What Carolyn’s post focused on is yet another expectation that one large segment of mystery’s readership has: that the story will have “moral worth”; that justice and goodness will prevail. But this expectation conflicts sharply with what one finds at the very hardboiled end of the crime-fiction spectrum, where the point is more often the exploration of criminality than the triumph of good. And as if these conflicting reader expectations in terms of content were not enough, there are also stylistic preferences to consider. In his post “Black Mask Magazine, Steve Fisher, and the Noir Revolution” Keith Alan Deutsch talked about the seismic change that occurred at Black Mask magazine with the transition from editor Joseph Shaw to Fanny Ellsworth—a “change from the objective, hardboiled writing promoted by Shaw . . . to the subjective, psychologically and emotionally heightened writing that came in vogue under her [Ellsworth’s] guidance”; a change which “led to creation of the film genre we now know as noir through the writings of Steve Fisher, particularly in his film scripts, and through the novels and short fiction of Cornell Woolrich . . . ” Keith quotes biographer William Brandon saying, in his book on Shaw, that Shaw preferred “good hard prose as against the spongy prose of subjectivity,” and adds that “action, not character, was at the center of Shaw’s aesthetic for exciting stories.” I think that rift in tastes regarding the manner in which hardboiled stories are told continues to exist today. 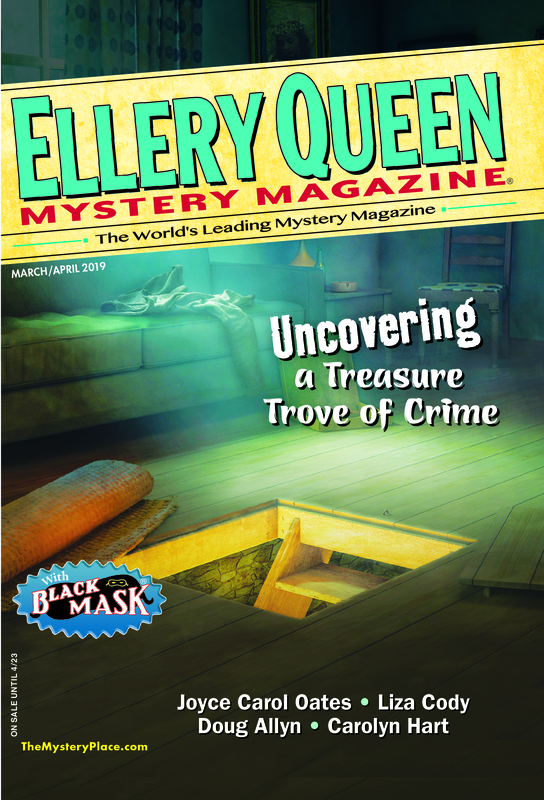 Though I sometimes hear it said (by people who are not and probably never have been regular readers of EQMM) that our magazine is primarily a venue for the traditional mystery and the pure suspense story, this simply isn’t true. The fame of EQMM’s founding editor Fred Dannay (a.k.a. Ellery Queen) as a writer of traditional mysteries has probably always colored impressions of his magazine. But it should not be forgotten that it was Dannay who “saved” Black Mask magazine for a time, incorporating it, when it ceased independent publication, as a department in EQMM; and a pundit once commented that Dannay had expanded the concept of the mystery so far that it seemed as if every great writer in history had produced at least one. The mantle I assumed when I took over the editor’s chair at EQMM felt heavy in the beginning, especially as I’d come from a “discovery house,” where I’d had the freedom to bring a large number of new writers into print—the freedom, in other words, to create an editorial world of my own, largely from scratch. EQMM had a tradition to uphold—and a grand one at that. Distinguished as she was, I imagine my predecessor, Eleanor Sullivan, must have felt a bit of that weight herself, because there have been few other magazines as closely associated with their founding editors as EQMM is with Fred Dannay, who was once said, in the New York Times, to be “the best magazine editor ever.” Dannay wasn’t hired to run an existing magazine: The concept for the publication was his and he had a role in finding its first publisher. He had worked as an art director and he dominated all visual aspects of the magazine as well as its literary content; he was a well-known scholar and collector in the field who unearthed little-known treasures for EQMM; and he invented, with EQMM, a new type of fiction magazine—one that would look and feel like a book and strive for the literary quality of books, within a field of popular (as opposed to literary) fiction. I have always felt that the magazine Dannay created must in a certain way remain his magazine; that is, it must maintain the essentials of his vision for it, or lose its identity. And yet each new editor, on inheriting a publication, must make it his or her own. The thrust of my own editorship at EQMM has always been to try to push the boundaries for what we include even farther out than where they were set by my predecessors. It’s why I started Passport to Crime and brought back Black Mask. Partly this is personal: I have catholic tastes, and want to share with readers the best that’s available of all the different forms I enjoy. But it also derives from a belief that what magazines like ours have uniquely to offer in a world that increasingly drives us all towards specialization is variety. The pleasure of a Christie mystery may lie primarily in the intellectual challenge of the puzzle, but the existence of that hangman reminds us that the puzzle is about something of great consequence. You can’t remove the puzzle element of the mystery entirely from the context of what is vital to human beings and their notions of justice—or from a pressing sense of danger—and expect it to hook us. The prospect of the terrible retribution of the noose makes the killers in Golden Age mysteries dangerous. And an acute sense of threat is central to some of the books even without it: Can anyone read Christie’s Sleeping Murder without feeling dread over those “monkey paw” hands—hands that will stop at nothing to remove the witness on the verge of figuring out who he is? Danger, and the suspense it generates, is an element in virtually all mysteries. So is some connection to justice. In Charles Willeford’s Sideswipe (spoiler alert!) the story ends with the sad-sack old man Stanley Sinkiewicz arrested for a capital crime. At least one of the arresting cops is happily cynical about this outcome, even though Stanley himself believes “I ain’t done nothing wrong.” Stanley’s partner in crime, who recruited him to finance a robbery that resulted in murder, “managed to keep me out of everything so I wouldn’t get involved,” Stanley tells them. Whatever we may think of the old man and his part in it all, his going to the electric chair hardly seems an entirely just outcome. It does, however, make for a memorable conclusion to a book that serves as an example of the type of hardboiled story I mentioned above, one in which it is the exploration of criminality and criminal characters, not the quest for justice, that is the engine for the story. Even so, could we imagine this ending having its ironic impact if we hadn’t been expecting a more just outcome? I cannot, in the space I have here, mention all of the links I see between the various forms of mystery and crime fiction. Nor do I wish to minimize the tendency of fans of one form to pass over works that belong to another. That kind of niche blindness is encouraged by the marketing techniques of online retailers like Amazon, who invite readers to seek more of the same: People who bought this book also bought . . . But I suspect many people are getting tired of having profiles made of their buying habits, for this can only result in a narrowing of focus—an arrow pointing back at themselves, or to people just like themselves. Where is the opportunity in that to expand one’s tastes? I’m reminded in this regard of a restaurant called La Mela that I discovered some time ago in Manhattan’s Little Italy. I’m told they now give patrons the option of selecting from a menu, but on the occasions when I visited this old-style, family-run Italian place you just took a seat and waited for platters of whatever they were serving to arrive at your table. In this era when YOUR CHOICE! seems to scream at us from every catalog and web page, and we’re encouraged to DESIGN YOUR OWN (the endless proliferation of choices needlessly siphoning away our time and energy), here there was almost no choice—and oh, how wonderful it was! What EQMM offers readers is the literary version of that La Mela experience—a “kitchen” in which choices are made for the reader, and by means of which, we hope, tastes are sometimes broadened. The guiding principle is variety—we try to include between the covers of each issue stories from as many categories as possible—though that is not, of course, to say that there are no limits at all to what we’ll present to our guests. Just as I probably would not return to La Mela if a “Chocolate Cricket Torte” or some other dish made with bugs appeared in front of me, we know EQMM readers will not continue to subscribe if we push them too far beyond their literary limits. This entry was posted in Books, Business, Fiction, Genre, Magazine, Publishing, Readers, Story, Writers and tagged choice, hardboiled, mystery, noir, publishing, puzzle, readers, reading, trends, variety, writers, writing. Bookmark the permalink. Excellent post, Janet! It’s always a pleasure to read your thoughts! This was a wonderfully presented insight into the role and mission of great editors; it’s no wonder EQMM thrives. Thanks, Janet. Awesome post, covering a lot of subjects and a long timeline. I knew mysteries had gotten popular in other countries, but I didn’t know the Japanese had divided them into three categories. Thanks so much, Josh, Lou, and Mel! I really appreciate your coming up on the site to offer a reply—not only for my own post but for those of others. (I think I’ve seen all of you commenting on various pieces, and it’s a nice boost for whoever has written the post.) Cheers!